Keeping deer away from budding flora is easier said than done. Mike McGrath shares some strategies in this week's Garden Plot. Keeping deer away from plants is easier said than done. Mike McGrath shares some strategies in this week’s Garden Plot. Seeds? Not a one, Ted. 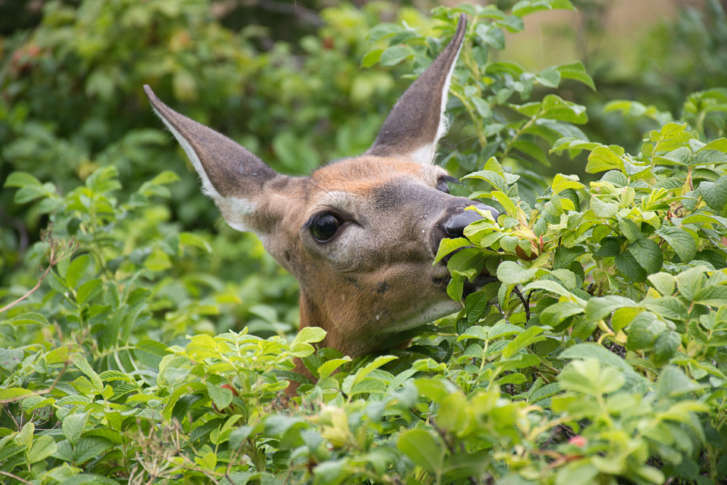 Although some trees, shrubs and annuals become “deer-resistant” when they mature and get tougher, sharper and/or nastier-tasting, all plants are deer candy when they are small sprouts. Plantings from seed should always be protected by fencing that encircles and covers the plantings (like a little cage with a top on it), or by one of the deer-deterrent devices that really works. One favorite is a motion-activated sprinkler that throws cold water at anything that comes too close to the plants. Another is “The Wireless Deer Fence”: small posts that attract deer with a special scent and then give them a battery-powered shock when they lick the electrified tops. You’ll find a good selection of motion-activated sprinklers online and at better garden centers. Or order The Wireless Deer Fence directly. How big does a fence need to be to defy deer? Well, the right kind of fence would allow you to grow anything — including legendary deer candy like tulips, hostas, azaleas and rhododendrons. But “the right kind of fence” is 11 inches taller than Shaquille O’Neal. That’s right: Although some people get by with shorter fences for a while, they run the risk of waking up to find Bambi with a broken leg thrashing about in their shrubbery, as deer can easily clear 6 feet. Professionally installed deer fence is the right height — 8 feet — and virtually invisible from most angles. Just don’t forget to deer-proof the driveway with a fence or in-ground “cattle guard” pipes. Ted in Chevy Chase adds that he wants some deer-proof living color in his yard but also doesn’t want to spend a lot of money. It always amazes me how people somehow think they should be able to get great results from plants that were on their last day before the dumpster. In gardening, you really get what you pay for — especially if you want plants that are going to be strong and healthy enough to resist deer attacks. The bigger, older and more-established the plant, the more deer-resistant it’s going to be. Yes, it will be more expensive, but it will also be instantly showy, filling a larger space or blooming more prolifically than a year-old bargain. Consider making this wise investment: Visit your local dedicated garden center (not a big box store) and ask them to suggest some easy-care deer-resistant plants. You’ll get professional advice and help keep a family business alive. You might even get a free garden design of you buy all the plants from them. The Mohonk Mountain House in upstate New York (where they’ve got more deer than trees — and they’ve got a lot of trees) has produced a detailed record of the annuals, perennials, trees and shrubs that deer have declined to dine on over a more-than-20-year period at the lushly landscaped resort. The list includes the annual flowers ageratum, begonia, foxglove, snapdragon, phlox, marigold and zinnia. Perennials include yarrow, bleeding heart, evening primrose and peonies. But that’s just a very small sampling; you’ll find the entire list at the Mohonk Mountain House site. Deer-proof plants? Stick with the A-team! Rutgers University has issued a great “report card” on the deer-vs.-horticulture problem, giving plants grades ranging from “A” (if they are rarely eaten) to “D” (the deer will be on them before you can get back inside the house). Among the A-listers are ageratum, American holly, big bluestem, bleeding heart, the Christmas fern, boxwood, foxglove, fritillaria, forget-me-not, sage, sweet flag, lamb’s ear, larkspur, all of the hellebores, lemon balm, pachysandra, pawpaw, peony, snapdragon and strawflower, to name just a few. Get the full list from Rutgers University.